The JBB Yellow Novelty Kid's Tractor Digger Bed is the perfect place for children to play, as well as providing a place to store bits and bobs and their belongings in the massive bucket, which also incoperates a book shelf. 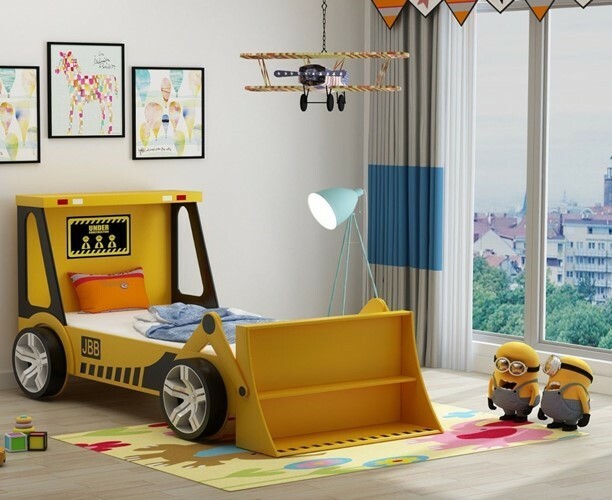 Bedtime should be fun and a place to wind down and the Yellow Tractor Digger Bed is a must have for your little worker. Designed to stimulate your child’s imagination and make their bedtime fun, the bed frame is sure to appeal to any active young child. It features a fun design with wonderfully coloured graphics and realistic looking wheels. Set within the frame is a strong slatted base that provides a solid foundation for your mattress. Low styled bed frame for easy access, the bed is a must have for any child.